Beautiful is a dangerous thing to be when one is unprotected. For seven years, Abigail has been a slave in the Visibullis house. With a Hebrew mistress and a Roman master, she has always been more family than servant . . . until their son returns to Jerusalem after his years in Rome. Within a few months Jason has taken her to his bed and turned her world upsidedown. Maybe, given time, she can come to love him as he says he loves her. But how does she open her heart to the man who ruined her? Israel’s unrest finds a home in her bosom, but their rebellion tears apart her world. Death descends with Barabbas’s sword, and Abigail is determined to be there when the criminal is punished. But when she ventures to the trial, Barabbas is not the one the crowd calls to crucify. Instead, it is the teacher her master and Jason had begun to follow, the man from Nazareth that some call the Son of God . . .
Born free, made a slave, married out of her bonds, Abigail never knows freedom until she feels the fire of a stray drop of blood from a Jewish carpenter. Disowned by Israel, despised by Rome, desired by all, she never knows love until she receives the smile of a stoic Roman noble. 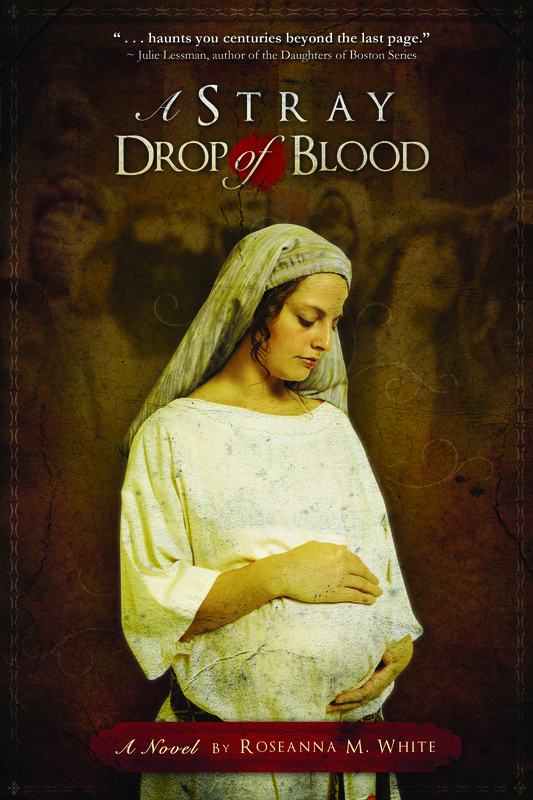 Narelle: A Stray Drop of Blood is Roseanna M. White’s captivating debut Biblical fiction novel. The story is set in Jerusalem and Rome around the time of Jesus’ ministry. Eight year old Hebrew girl Abigail is orphaned and sold into slavery by her stepfather. She is purchased by a Roman prefect as a companion for his Hebrew wife. Abigail is educated and raised as if she was their own daughter and her immense beauty is both a blessing and curse. Six years later her master’s son, a Roman soldier, returns home after a six year absence and claims Abigail as his own before she can be given in marriage to her fellow slave and best friend. Abigail is forced to accept her new situation and feels abandoned by her God. Tragedy befalls her Master’s household and Abigail’s encounter with Jesus on the day he is crucified both challenges her faith and transforms her life. Her faith is tested as she loses loved ones and cannot escape being treated as a Hebrew slave despite changes in her circumstances. A powerful love story unfolds and Abigail struggles with her seemingly futile desire to be with the man she loves. A Stray Drop of Blood is an honest story that explores the best and worst of human nature. Realistic and compelling character’s struggle with temptation and the differences between the Hebrew and Roman society create strong emotional conflict. The story is action packed, with masterful plot twists and the spiritual element flows seamlessly through the story. I recommend A Stray Drop of Blood to those looking for a challenging and exciting Biblical fiction story.